You know, it's not like it's a challenge to make it look like a golden retriever is driving a school bus. No, it's more like nearly flippin' impossible. But thanks to my ever diligence in lowering my standards, I convince myself that I'm rather happy with the results of this photo op. We can pretend that our Cool Bus is transporting kids to some British-ish institution of education, say like Hogwarts. 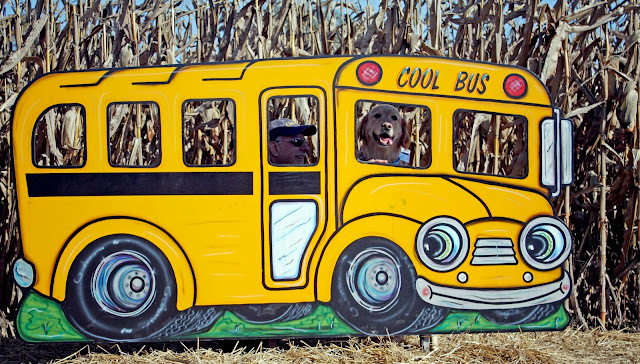 Because where else but a school of magic would a golden retriever be at the wheel on the right side of a school bus. With his five-fingered hand braced upon the dashboard for support as the bus balances on two wheels along those sharp turns. And who is dropping off that last kid on the bus route. The one kid who sampled the ageing potion in chem class against all warnings that it wasn't quite ready yet. This photo is brought to you courtesy of Micron and the Husband. Both being good sports in public, while I direct this whimsical scene at our favorite pumpkin farm. Make it look like the dog is driving the bus, I said. Really? I said. Alrighty then. Huh. At least that part was easy. Micron looks like an excellent bus driver. So friendly!